Back To School Bash Health Clinic @ Pickens Co Health Dept. One-Stop Spot for School State Health Requirements! Is your child ready for the upcoming school year? 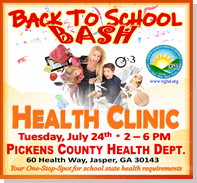 The Pickens County Health Department is conducting a Back To School Bash Health Clinic on Tuesday, July 24th from 2 p.m. to 6 p.m. at the public health department in Jasper. The required Hearing, Dental, Vision and BMI/Nutrition Screenings will be available: Total cost for screenings is $50. Also, immunizations will be provided for school-age children for $21.90 each (for uninsured or underinsured). Medicaid, including Amerigroup, Caresource, Peachstate and Wellcare, and Peachcare for Kids are accepted. Each child who attends gets a FREE Goody Bag with Crayons, Coloring Book, Toothbrush, Pamphlets and Coupons! The Pickens County Health Department is located at 60 Health Way in Jasper. For more information or to check on additional insurances accepted, call (706) 253-2821.